CHICAGO, June 29, 2017 /PRNewswire/ -- For the 18th year, CNA has named Fresenius Medical Care North America (FMCNA), the North American operations of Fresenius Medical Care AG & Co. KGaA, the recipient of the national CNA Safety In Excellence Award. This award recognizes a company's national leadership and dedicated commitment to employee health, safety, loss prevention and risk control. For nearly two decades, FMCNA has demonstrated significant reductions in employee lost time injury rates. "We're proud to recognize Fresenius Medical Care North America for its dedication and commitment to employee health, safety, loss prevention, and risk control," said Kevin Leidwinger, President and Chief Operating Office, CNA Commercial. "Fresenius continues to show its commitment to maintaining a safe environment throughout its organization and has received the CNA Safety in Excellence Award for 18 years." 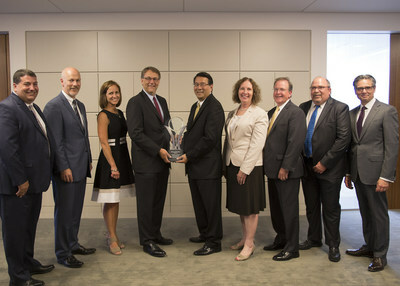 "The quality and safety of our products and services is a top priority at Fresenius Medical Care, ensuring the best possible experience for our patients and employees," said Lawrence Park, Vice President of Corporate Health, Safety, Environmental Affairs, Engineering, Security and Risk Management, FMCNA. "We're honored to be recognized by CNA for the 18th year for our dedication to promoting and maintaining a safe work environment." Fresenius Medical Care North America is the premier health care company focused on providing the highest quality care to people with renal and other chronic conditions. Through its industry-leading network of dialysis facilities, outpatient cardiac and vascular labs, and urgent care centers, as well as the country's largest practice of hospitalist and post-acute providers, Fresenius Medical Care provides coordinated health care services at pivotal care points for hundreds of thousands of chronically ill customers throughout the continent. As the world's largest fully vertically integrated renal company, it offers specialty pharmacy and laboratory services, and manufactures and distributes the most comprehensive line of dialysis equipment, disposable products, and renal pharmaceuticals. For more information, visit the FMCNA website at www.fmcna.com.